Fifty years ago this week, Cardinal Richard J. Cushing, the Archbishop of Boston, delivered a speech in Rome that changed history. Two years earlier, Pope John XXIII had convened the Second Vatican Council when he invited 2908 bishops from around the world to Rome. He urged adoption of the Church reforms he felt were required in a century that had produced scientific and intellectual revolutions, Nazism, Fascism, Communism, two world wars, nuclear weapons, and the Holocaust. High on the papal agenda was the need for the Roman Catholic Church to change its often-negative teachings about the Jewish people and Judaism. John XXIII chose Vatican biblical scholar Cardinal Augustin Bea to direct that task. Both the Italian pope and the German cardinal believed it was imperative for the Church to discard its traditional adversarial attitudes about Jews and Judaism, and replace them with a new constructive relationship. Early in his efforts, Cardinal Bea was overly optimistic. He predicted any Council statement on the subject would be a "footnote" and not a "free standing document." However, the Declaration the bishops ultimately approved is today considered a major achievement, and hardly a footnote. But it was not smooth sailing. Some bishops were opposed to any statement and Cardinal Bea's first draft on Catholic-Jewish relations underwent numerous revisions. Indeed, Cardinal Bea was forced to submit a series of controversial drafts that attracted intense interest in the global media as well as drawing close scrutiny from the Jewish, Protestant, and Eastern Orthodox representatives who were official Vatican Council guests or observers. In June 1963, Pope John XXIII died and was succeeded by Pope Paul VI who continued his predecessor's efforts to adopt a strong declaration about Jews and Judaism. One of Cardinal Bea's drafts made specific reference to the odious deicide charge -- the belief the Jewish people were eternally condemned by God for their alleged role in the death of Jesus. For centuries the frequently lethal "Christ killer" charge had been hurled at Jews. But "deicide" was deleted from the draft because it was not an official Church teaching, and, it was argued, Council participants could not vote on the concept. In the summer of 1964, Cardinal Bea had crafted a lengthy third version of his "footnote." It repudiated all forms of prejudice, anti-Semitism, and it implicitly rejected the deicide charge. The draft urged Catholics to foster mutual respect and knowledge of Jews after two millennia of misunderstanding, suspicion, and distrust. But without John XXIII's extraordinary leadership, a weary 84-year-old Cardinal Bea faced the grim possibility the entire document might be voted down or tabled; either Council action would relegate his efforts to the dustbin of history. At this nadir in Church history, a group of American bishops became alarmed believing any positive statement on Jews and Judaism might be doomed. Led by Cardinal Cushing and Cardinal Francis Spellman of New York, U.S. Catholic leaders moved to make sure a significant document emerged after years of indecision. Cardinal Cushing hated to venture far from his beloved Boston, but he traveled to Rome to lead the effort to adopt a strong statement. 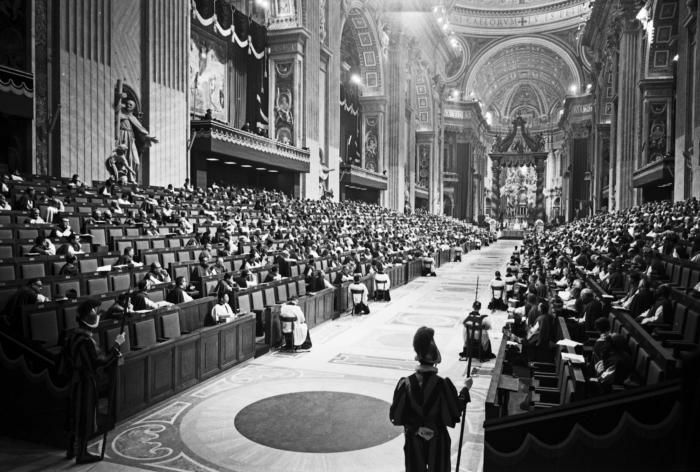 Inside St. Peter's Basilica on Sept. 28, 1964, Cushing read his speech (about a thousand words in English translation) to his fellow bishops in Latin, the designated Vatican Council language. One observer recalled the cardinal's raspy, gravelly voice with its New England accent shattered the microphones and loudly echoed throughout the vast sanctuary. Cardinal Cushing demanded the Council statement be "more positive, less timid, more charitable." He added, "we cannot dare attribute to later generations of Jews the guilt of the crucifixion…(there is) universal guilt …we must deny that the Jews are guilty of the death (of Jesus)…"
"There is no Christian rationale -- neither theological nor historical-- for any iniquity, hatred or persecution of our Jewish brothers….In this our age (of the Holocaust), how many Jews have suffered! How many have died because of the indifference of Christians, because of silence!...let our voices humbly cry out now!" Cushing's powerful speech was widely reported and he was featured on a Time magazine cover. A year later, in October 1965 the world's bishops adopted the now historic "Nostra Aetate" ("In Our Time") statement that has permanently changed Christian-Jewish relations. Cushing helped insure the final vote wasn't even close: 2221 to 88. Rabbi Rudin, the American Jewish Committee's Senior Interreligious Adviser, is the author of "Cushing, Spellman, O'Connor: The Surprising Story of How Three American Cardinals Transformed Catholic-Jewish Relations."